"Producing prostheses for animals is no different than producing prosthesis for humans," says Elena Kitaeva, manager of the animal orthopedics department at the Yekaterinburg Prosthetic-Orthopedic Enterprise. Until a few years ago, prostheses for disabled dogs were homemade in Russia, while rehabilitation equipment was mostly imported from Europe. Russian developers, however, have recently made significant progress in this sector. A prosthesis factory in Yekaterinburg, specializing in orthopaedic products for humans, launched a line for animals last year. The first canine client was Masyanya, a dog who had lost its front paw. Masyanya's owner had visited many clinics throughout Russia but no one could help. When he finally appealed to specialists at the Yekaterinburg factory, they came up with the idea to produce prostheses for disabled dogs. "Producing prostheses for animals is no different than producing prostheses for humans," said Elena Kitaeva, manager of the animal orthopaedics department at the Yekaterinburg Prosthetic-Orthopaedic Enterprise. "They are produced using the same materials and are custom-made for the patient. The only difference is that when trying on a prosthesis a person can say where he or she feels discomfort, while an animal can't. That's why it's more challenging with animals than people," said Kitaeva. The production facility has a special area with a separate entrance for dogs and their owners. Once the casts are removed from the dogs, they are made to try on the prosthesis, which is then adjusted. The owners are then informed about how to manage the pet’s artificial limb. There are many requests for such prostheses, not only from Russia but also from neighbouring countries. Unfortunately, not all animals can receive help. The prostheses are made only if the animal is healthy, with at least half the limb remaining. The factory also produces other items, like a brace that supports the dog's neck and head in the right position after injuries and illnesses. This facility in Yekaterinburg is the only place where these are made for the Russian market. 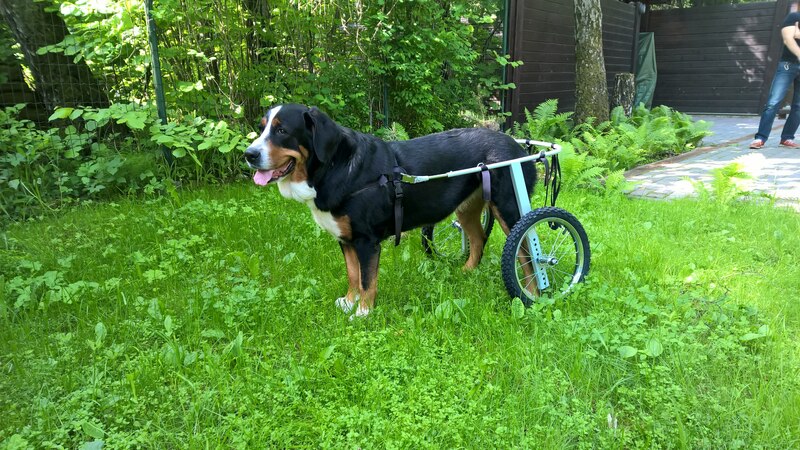 Wheelchairs give mobility to dogs whose hind legs do not function. Currently, only private specialists and some companies make such wheelchairs in Russia. Moscow's Animal Mobile, however, makes not only two-wheeled chairs for the hind legs, but also four-wheel chairs in case all of the animal's legs do not function. "Our wheelchairs were developed by engineers from the old Soviet school who could build a spaceship out of nothing," explained Gulnara Odjkha, director of Animal Mobile. “These wheelchairs were designed together with veterinary surgeons and were made from steel, unlike most Russian and foreign equivalents. This renders the wheelchair light and sturdy," said Odjkha. Wheelchairs for dogs help the pet lead a normal lifestyle — allowing it to walk, stand and run autonomously. Some specialists say that preservation of mobility helps the dogs fully recover and, in some cases, they even begin walking by themselves again. "The dog became lively, cheerful and strong, and his hind paws preserved some mobility. The dog even began jerking its legs in sleep!" said a satisfied dog owner. One of the newest Russian rehabilitation developments is a water treadmill for dogs from the Fit4Pet company. This helps dogs recover their mobility after surgery, as well as to shed weight and increase their endurance. "The developers worked with leading rehabilitation veterinarians and sports doctors who have experience with European equipment," said Fit4Pet's executive director, Alexei Mokhnatkin. "We took into consideration doctor’s recommendations and created solutions that existing equipment did not provide." The Russian device is marked by increased comfort and security for the patient. Water enters the treadmill significantly faster than its competitors and almost silently in order not to cause the dog any extra stress. The doctor or instructor may work near the animal inside the tank, something that is particularly important for heavier patients. The water goes through several purification stages because, as Mokhnatkin said, animal owners demand the best quality of water. Usually veterinary clinics and companies that work with sports dogs order large and complex equipment. Russian breeders and farms are now beginning to use the new water treadmills.